Did you know I make each and every piece of pottery I sell? ( If you didn’t you should!) While I do have some of the greatest studio assistants ever, I have not ever had anyone else make the pots I paint and carve my designs on. Somehow it just isn’t right for my process in clay. I have to throw the clay and make each and every piece. Some days it’s exhausting, but mostly it’s awesome. 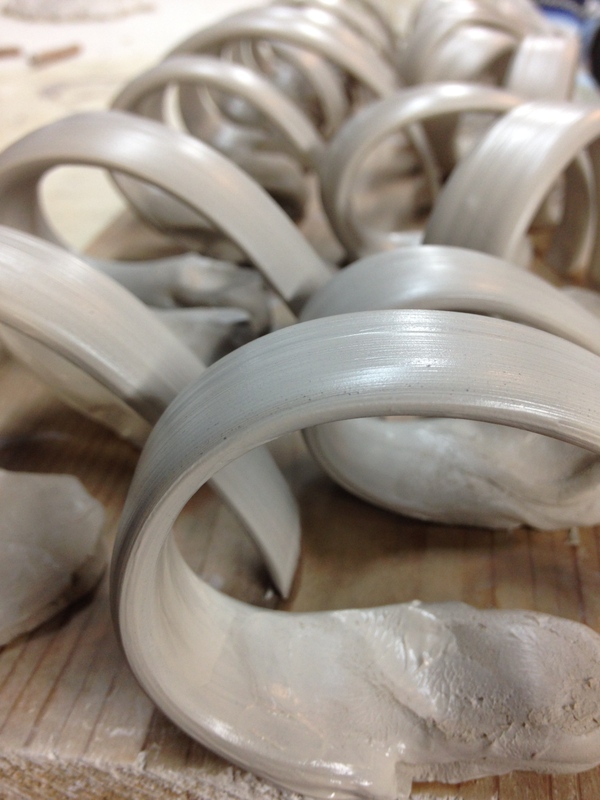 Throwing is THE thing that excited me most about ceramics as a young kid, and it’s still the place I love to be. 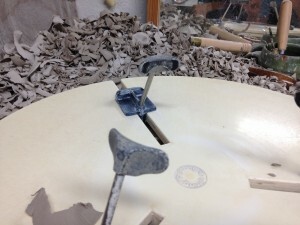 Sitting at my wheel, making pots, wearing my fancy clothes. ( Ha!) Mostly I resemble a hobo, and often don’t bother laundering my throwing clothes until they’re really really dirty. Why waste the water, if they’re just going to get all mucked up again tomorrow? By far and away the most popular shape is my mugs. It’s the form I’m most often making in the studio. 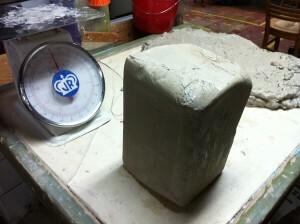 I start with between 1 -1 & 1/4 pounds of clay. After throwing I place them on a board. I call this a rack. Each fits ~16 cups. ( I call anything with a handle a mug, and without a handle a cup) I think of each rack like a dye lot. Its a small group, all born at the same time. Sometimes they’re almost identical, sometimes more like second cousins. See? After the cups set up, and become what we call leather hard, I clean up the bottoms of them. Leather hard is the stage at which the pots have lost some of the moisture added in the throwing process and are hard enough to retain their shape. 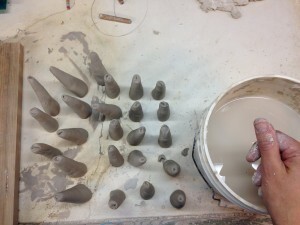 The pots are still wet enough to add another piece of clay to. All of my handles start with “carrots”. 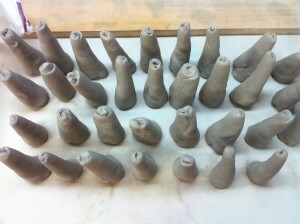 I take a larger chunk of clay and break off smaller pieces, roll them on my plaster table into little carrots. One side is tapered and the other stubby. 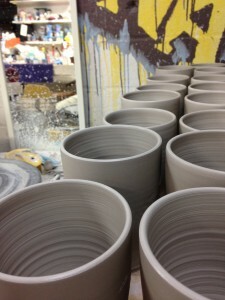 I stack a bunch of them in formation, enough for a rack or two of cups. I hold the stubby end in my left hand and pull the clay with my wet right hand. The result is a larger version of the handle that ends up on the mug. 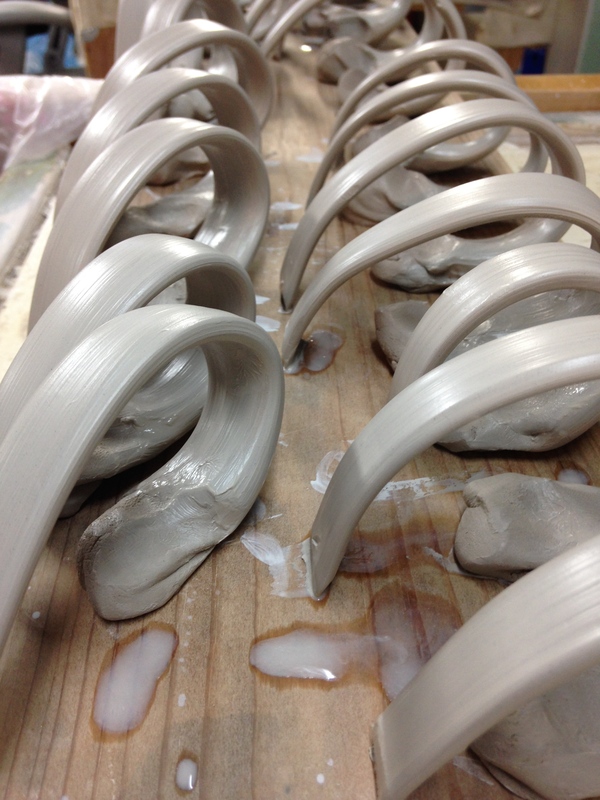 These set up for a few hours and then I marry the handle and the cup and behold, a mug is born! Pretty Cool. This entry was posted in studio on September 25, 2014 by Jennie. Glad you like it! I have a few more of those up my sleeve. Thanks for helping me reach a professional milestone. I have always longed to be in the company of Sesame Street. Maybe I can show Elmo how a pot is made?